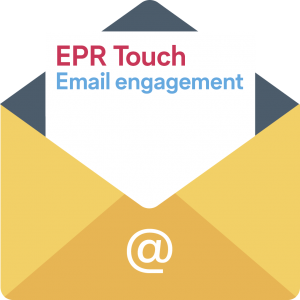 Eproductive introduced email engagement on behalf of its 90 charity retail clients some eight years ago. Since then we have collected nearly 3 million email addresses of Retail Gift Aid donors and in a busy week will send out 100,000 emails. Here, Director Nick Cowls explains some of the features of the sophisticated emailing platform designed to ensure maximum performance and deliverability, whilst keeping the process as simple as possible for donors, volunteers and retail staff. Before delving into how our platform works here’s a quick summary of the key benefits of email over physical letters. It’s cheap– Even at scale it costs around 25p to send out a letter. 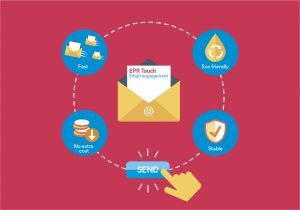 At Eproductive, we manage the whole process for clients as part of the package so there is no additional cost in sending email. It’s environmentally friendly– Research shows showed that the typical email generates around 4g of carbon compared to 25-30g of carbon for a letter. So, whilst emails are not completely carbon free, they are significantly better for the environment than their paper equivalent. It’s stable – We carried out a straw poll and discovered that four times as many people were thinking of moving to a new house in the coming ten years than were planning to change their personal email address, so email has a longer lifespan for donor engagement than a physical address. It’s clear, then, that email is a great engagement tool for donors – but it’s not easy. In the ever-increasing digital noise, there are some issues with using it as a way to communicate directly. Here are just some of the activities we carry out on behalf of clients to avoid the pitfalls and ensure they stay as connected as possible with their donors. Data capture – We work hard to ensure that the email address is entered correctly. When an email is entered we carry out 15 separate checks to ensure that the format is correct (for example there must be an @ sign), we also support double entry of email address to remove typos. And we provide tablet software to enable donors to enter their own details. Email format – In 2017 the iPhone was the most popular device to read emails on with 28% of the total market. To ensure that donors can view their emails we regularly test formats against all the major devices and email providers to ensure they display well. Email Delivery – Every day 400 billion spam emails are sent out across the world, accounting for 86% of global email traffic. Receiving email servers are becoming ever more sophisticated in their attempts to prevent spam being received by customers. They inspect the content, check the volumes of email being sent in a batch and will even look at the reputation of the sending server when deciding whether an email is spam. To maximise deliverability, we use a sophisticated mail queueing system that undertakes dynamic and intelligent throttling of mail delivery to ensure that clients emails are not treated as spam. Email Responses – A surprising number of people reply to emails – even if it is made plain that the account is not monitored – often they will just be pleased to receive the thank you but sometimes they will ask for more information or an address update. We capture these replies on behalf of clients and forward them for further action. Managing bounce backs – despite everyone’s best efforts, bounce backs will happen and they can happen for many reasons – some are permanent (email address doesn’t exist) whilst others are temporary (recipient inbox is full). To maximise deliverability, we will attempt to automatically re-deliver temporary failures for up to 4 days before failing those mails. This ensures that all mails have the maximum chance to be delivered. Fixing bounce backs – if an email fails permanently we will flag this at the right time to get it fixed. Then, when a donor re-donates, we will display the current email address and status on the till (or tablet depending on how the repeat donation is being processed) which prompts a staff member to correct the address going forward. Audit Trails – we maintain a full audit trail of transactions and failed emails to ensure that there are no issues when it comes to an HMRC audit. Apart from being vital for engagement reasons, it is an HMRC requirement that donor’s details are kept up to date to ensure that claims are valid. Charities tend to be a long way down the list of a donor’s mind when they are updating contact details, with banks, building societies and utility companies being top of the list. At Eproductive, we provide MyGiftaid.com a secure website where donors can update their own details from a link provided on every email that we sent out.